PITTSBURGH -- Starling Marte hit a solo home run off George Kontos with two outs in the ninth inning, lifting the Pittsburgh Pirates to a 3-2 victory over the San Francisco Giants on Saturday. 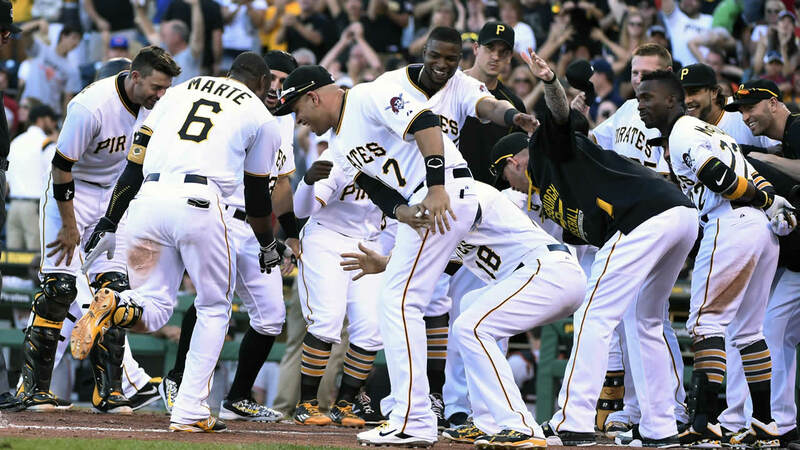 Jung Ho Kang hit a pair of solo homers for the Pirates in the matchup of playoff contenders. #SFGiants fall to the Pirates, 3-2. Marte with the solo HR for the walk off win. Marte sent the first pitch he saw from Kontos (2-2) into the sun-drenched seats in left field for his second career walkoff hit. Mark Melancon (3-1) needed six pitches to get through the top of the ninth to set up Marte's winner. Pittsburgh's bullpen has won 18 straight decisions, the longest streak in the majors since 1909. San Francisco starter Mike Leake allowed one hit in six innings but was removed for a pinch hitter with the tying run on third and one out in the seventh. Ehire Adrianza had an RBI single for the Giants. Leake showed no ill effects of the left hamstring strain that sent him to the disabled list on Aug. 3. Manager Bruce Bochy put the newly acquired right-hander through the paces in pregame anyway, having Leake cover first and run the bases just to make sure. Leake's mobility was never a problem, perhaps because the Pirates rarely made him take a step off the mound. He faced the minimum through the first four innings before Kang sent a fastball into the seats in center to tie the game at 1. It was the only bobble by Leake. He needed only 77 pitches to get 18 outs but found a spot on the bench in the top of the seventh when Bochy decided to send pinch-hitter Kelby Tomlinson to the plate with the go-ahead run on third and one out. The move didn't work out. Tomlinson lined out and Nori Aoki hit a grounder to end the threat. Pittsburgh starter Gerrit Cole, covering the bag, gave a fist pump as he collected the throw from Pedro Alvarez to finish off his best start in nearly a month. Cole surrendered one run on three hits in seven innings, walking three and striking out eight. Hunter Strickland came on for Leake and appeared to get out of a jam when Marte was caught stealing at third. Kang hit the next pitch 424 feet into the San Francisco bullpen to put the Pirates up 2-1. Pittsburgh's normally reliable bullpen, however, faltered. Matt Duffy led off the eighth with a walk from Joakim Soria and eventually scored on a wild pitch to tie the game. Giants: The team is optimistic OF Angel Pagan is close to a return from right knee tendinitis that landed him on the disabled list on Aug. 10. He received a platelet-rich plasma injection in the knee, with promising results. ... Bochy said the team is hoping to get 2B Joe Panik back by the first week of September. Panik has been out since Aug. 3 with lower back inflammation. "We knew it would be a slow process," Bochy said. "There's no schedule. There have been no setbacks. This is the rehab we had planned for him to make sure we don't have a setback." The series wraps up on Sunday night when Ryan Vogelsong (9-8, 3.93 ERA) faces Pittsburgh's Francisco Liriano (8-6, 3.35). Vogelsong hasn't allowed more than three runs in any of his six starts since July 5. The Pirates have won each of Liriano's last nine starts.